Hawaii ranks 49th in the nation for use of home health care services during the last six months of someone’s life. 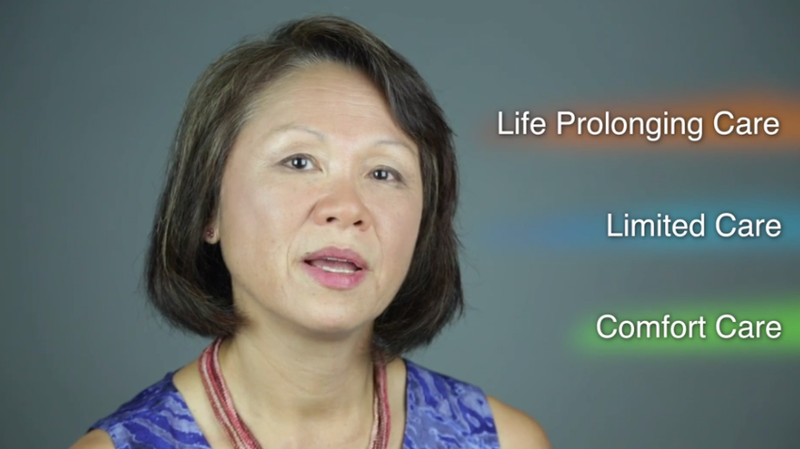 Videos from ACP Decisions show patients what their options are at the end of life. Lena Katakura’s father is 81. He was recently diagnosed with esophageal cancer and doctors don’t expect him to survive the illness. Katakura says a nurse at their Honolulu hospital gave them a form to fill out to indicate what kind of treatment he’d want at the end of life. While, the majority of Americans say they’d rather die at home, in many cases, that’s not what happens. Among people 65 years of age or more, 63 percent die in hospitals or nursing homes, federal statistics suggest, frequently receiving treatment that’s painful, invasive and ultimately ineffective. And Hawaii is one of the states where people are most likely to die in the hospital. The video that Katakura and her father watched pulled no punches. It begins: “You’re being shown this video because you have an illness that cannot be cured.” Then, in an undramatic fashion, it shows what’s involved in CPR, explains what it’s like to be on a ventilator, and shows patients in an intensive care unit hooked up to multiple tubes. “You can see what’s really going to be done to you,” says Katakura. And you can decide not to have it done. The video explains that you can choose life-prolonging care, limited medical care or comfort care. The simple, short videos are being shown in medical offices, clinics and hospitals all over Hawaii now. And they’re being shown in many of the languages that Hawaiians speak: Tagalog, Samoan and Japanese, among others. Lena Katakura and her father watched the video both in English and in Japanese. “Some patients have said, ‘Wow, nobody’s ever asked me what’s important to me before,’ ” says Dr. Rae Seitz. She’s a medical director with the non-profit Hawaii Medical Service Association (HMSA) — the state’s largest health insurer. She says there are a number of obstacles that keep patients from getting the treatment they want. Some health care providers may talk about it, she says, some may not; and each doctor, clinic, hospital and nursing home may have different standards. But also “it takes a lot of time, and currently nobody has a good payment system for that,” says Seitz. Out of 50 states, Hawaii ranks 49th in the use of home health care services toward the end of life. Seitz wanted to change that and she’d heard about these videos produced by Dr. Angelo Volandes of Harvard Medical School. She thought maybe they could help. So she brought Volandes to Hawaii to give a little show-and-tell for some health care providers. Volandes thinks they were excited and — maybe — a little bit relieved. Volandes is the author of a book called The Conversation. 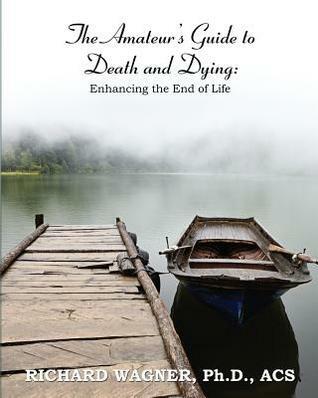 It tells the stories of some of the patients he encountered early in his career and their end of life experiences. He describes aggressive interventions performed on patients with advanced cases of cancer or dementia. In the book, they suffer one complication after another. There is never a happy ending. Still, studies show that the vast majority of people who see these videos usually choose comfort care — the least aggressive treatment. That’s compared to patients who just have a chat with a doctor. Every health care provider in Hawaii currently has access to the videos, courtesy of the Hawaii Medical Service Association. The impact on patients will be studied for three years. But one thing that won’t be examined is how patients’ choices affect cost, Seitz says. Katakura’s father is. He’s at home with her, and receiving hospice services. After seeing the videos, she says, he chose comfort care only. Now, she says, she needs to make a decision for the kind of care she wants for herself at the end of life — while it’s still, she hopes, a long way off. This excerpt from an ACP Decisions video was posted by NPR member station KPCC. You can view the full catalog on ACP Decision’s website, but they note that the videos are not meant for individual use; they’re designed to be part of a conversation between providers and patients. Tumors had disfigured AshLeigh McHale’s features and spread to her organs. 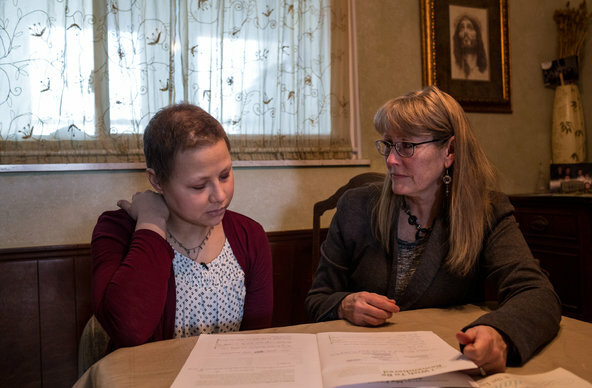 A year ago, AshLeigh, 17, flew from her home in Catoosa, Okla., to the National Institutes of Health in Bethesda, Md., with a thread-thin hope of slowing her melanoma. One morning a social worker stopped by her hospital room. They began a conversation that would be inconceivable to most teenagers: If death approached and AshLeigh could no longer speak, what would she want those who surrounded her to know? The social worker showed AshLeigh a new planning guide designed to help critically ill young patients express their preferences for their final days — and afterward. If visitors arrived when AshLeigh was asleep, did she want to be woken? If they started crying, should they step outside or talk about their feelings with her? What about life support? Funeral details? Who should inherit her computer? Or Bandit, her dachshund? AshLeigh grabbed her blue and hot-pink pens, and began scribbling furiously. When she died in July, she was at home as she had requested. Per her instructions, she was laid out for the funeral in her favorite jeans, cowgirl boots and the white shirt she had gotten for Christmas. Later, the family dined, as AshLeigh had directed, on steak fajitas and corn on the cob. AshLeigh McHale, center, gave her family detailed instructions about her final wishes, including those concerning her funeral. A national push to have end-of-life discussions before a patient is too sick to participate has focused largely on older adults. When patients are under 18 and do not have legal decision-making authority, doctors have traditionally asked anguished parents to make advanced-care choices on their behalf. More recently, providers have begun approaching teenagers and young adults directly, giving them a voice in these difficult decisions, though parents retain legal authority for underage patients. There are no firm estimates of the number of young patients facing life-threatening diseases at any given time. Cancer, heart disease and congenital deformities together account for an estimated 11 percent of deaths among adolescents, about 1,700 per year. And many thousands live with the uncertainty of grave illness. “If you are one of the children for whom this matters, or one of their parents, this is a huge opportunity,” Dr. Chris Feudtner, a pediatric palliative care physician and ethicist at the Children’s Hospital of Philadelphia, said of these conversations. But shifting from hushed talks with parents to conversations that include young patients has met some resistance. Many doctors lack training about how to raise these topics with teenagers. Until recently, most clinical teams believed that adolescents would not understand the implications of end-of-life planning and that they might be psychologically harmed by such talk. Sometimes when providers do make the attempt, parents or patients may abruptly change the subject, fearful that by joining in, they are signaling that they have abandoned hope. Yet research shows that avoiding these talks exacerbates the teenage patient’s fear and sense of isolation. In a 2012 survey examining end-of-life attitudes among adolescent patients with H.I.V., 56 percent said that not being able to discuss their preferences was “a fate worse than death.” In a 2013 study, adolescents and parents described such directed family talks as emotionally healing. Teenage patients can guide, even lead, their medical care, Dr. Feudtner said. But more important, including them in the discussions acknowledges a terrible fact that patient and family members struggle to keep from each other: the likelihood of death. Karly Koch, 20, worshiping in Muncie, Ind. She has a rare genetic immune disorder, and has written about her end-of-life plans. 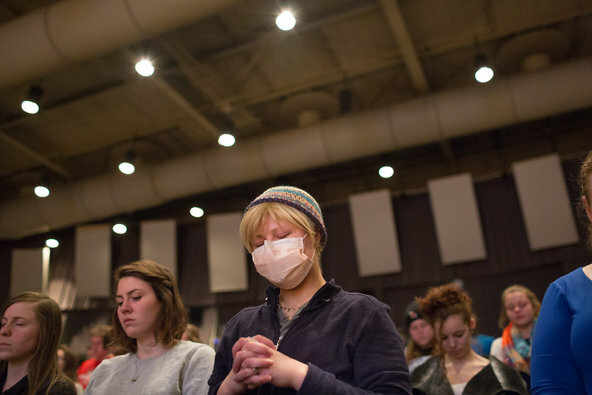 Karly Koch, a college student from Muncie, Ind., has been treated for many serious illnesses, including Stage 4 lymphoma, all related to a rare genetic immune disorder. Her older sister, Kelsey, died of the condition at 22. Last spring, Karly, then 19, developed congestive heart failure. Her renal arteries were 90 percent blocked. As Karly lay in intensive care at the National Institutes of Health, a psychotherapist who had worked with the family for years approached her mother, Tammy, with the new planning guide. The guide used by Karly Koch and AshLeigh McHale is called “Voicing My Choices.” While there are end-of-life workbooks for young children and their parents, as well as planning guides for older adults, this is the first guide created for — and largely by — adolescent and young adult patients. The intention was to create a way for them “to make choices about what nurtures, protects and affirms their remaining life and how they wish to be remembered,” said Lori Wiener, a social worker and principal investigator on the research that led to the planning guide. Karly Koch with her mother, Tammy. In the two years since its introduction, more than 20,000 copies have been ordered by families and more than 70 medical centers from Aging With Dignity, the nonprofit that publishes it. “Voicing My Choices” has also been translated into Spanish, Italian, French and Slovak. What gives you strength or joy, the guide asks. What do you wish to be forgiven for? And who do you wish to forgive? Karly Koch with her family in Indiana. By offering young patients opportunities to write farewell letters, donate their bodies to research and create rituals for remembering them, the planning guide allays one of their greatest fears: that they are too young to leave a meaningful legacy. And so the ability to do it can galvanize them. Lauren Weller Sidorowicz received a diagnosis of metastatic bone cancer at age 18. Determined and outspoken, she joined a focus group of young patients at the N.I.H. whose opinions led to the creation of the planning guide. Days before she died in 2011 at age 26, Ms. Sidorowicz paged Dr. Wiener, frantic to include a final thought in a farewell letter. There are no standards for when and how to introduce a critically ill teenager to end-of-life planning; there are only intuition and experience. Many pediatric cancers have favorable prognoses, Dr. Feudtner said, and raising the topic prematurely may provoke anxiety and fear. More often, though, doctors postpone the discussion too long, until the patient is too sick to take part. Dr. Maryland Pao, a psychiatrist at the National Institute of Mental Health who helped design the guide, recalled the despair of a mother whose dying son could no longer speak. Dr. Wiener believes preparation should be done soon after diagnosis, but when the patient is stable. Exploratory talks, she said, become steppingstones, each readying the patient for the next one. And sometimes teenagers themselves put up obstacles to having frank family discussions. Some young patients, for example, did not want Dr. Pao to tell their parents that they were ready to stop treatment. Rather than say as much to their heartbroken relatives, some will pour out their feelings on social media. But shortly after the transplant, she relapsed. “It was comforting to get my wishes down on paper and free myself to live without worrying about the details of dying,” she said recently. She died on Wednesday. Her body is going to the N.I.H. for a research autopsy, as she wished, her mother, Ellen, said. Ms. Koch on her way to have blood drawn. On July 25, Karly Koch had an experimental bone marrow transplant. Her family calls that date her “re-birthday.” With 12 medications a day and a surgical mask, she is out and about in Muncie. Karly takes classes to become a physical therapy assistant. She is a youth leader at her church, where her boyfriend is also a member. She delights in “normal people” activities. Do Dogs Grieve Over a Lost Loved One? Can dogs comprehend the meaning of death and do they grieve because of it? by Stanley Coren Ph.D., F.R.S.C. I have always been very fond of this painting and moved by the obvious emotional bond and loyalty that the dog clearly seems to feel for his master. There is no doubt that a dog in this situation would be feeling sorrow, perhaps depression, and a deep sense of loss. However behavioral scientists often debate the question as to whether dogs actually feel grief when a loved one dies. Those that doubt it suggest that grief requires some concept of the nature and implications of death. This is beyond the mental ability of human children before the age of four or five years, and since evidence suggests that mentally and emotionally dogs are equivalent to humans aged two to three years of age (click here or here to read more about this topic) this would imply that dogs do not yet have the capacity to understand that concept as well. To get an idea as to what may be going on in a dog’s head when a loved one dies we can look at what goes on in the mind of a child in the two to five year age range. These children do not understand that death is irreversible. It is common for a young child to be told something like “Aunt Ida has died and won’t be coming back,” only to have the child ask a few hours later “When will we get to see Aunt Ida again?” Children do not comprehend that the life functions of their loved one have been terminated and this is reflected in their questions as they try to understand the situation. They ask things like: “Do you think we should put a sandwich or an apple in Grandma’s coffin in case she gets hungry?” “What if Daddy can’t breathe under all that earth?” “Will Uncle Steve be hurt if they burn him?” “Won’t Cousin Ellie be lonely in the ground by herself?” In the absence of an understanding of death there can be pain and sorrow and depression, but the behavioral scientists suggest that this is different from the more adult feelings of grief. In my own home, I saw the heartache and sorrow that the loss of a loved one could bring to a dog when my cherished Flat-coated Retriever, Odin, died. My Nova Scotia Duck Tolling Retriever, Dancer, had lived with Odin every day since Dancer was eight weeks of age. They would play together for hours and simply seemed to enjoy each other’s company. With Odin now gone, Dancer systematically looked at each of the four locations where his friend would go to lie down. After doing this several times he wandered to center of the room, looking around forlornly, and whimpering. His anguish only gradually wound down and it was several weeks before he stopped checking all of the places that Odin should have been whenever he came home from a walk. Much like one might expect from a child who did not have the concept of the permanence of death Dancer never gave up on the idea that Odin might reappear. Up through the last year of his long life Dancer would still rush toward any long-haired black dog that he saw, with his tail batting and hopeful barks as if he expected that perhaps his friend had returned. This is what I think about when I see things like the photograph of Jon Tumilson’s funeral. After the Navy SEAL was killed in Afghanistan in 2011, more than 1000 friends, family, and and community members attended the funeral in Rockford, Iowa. The mourners included his “soul mate” Hawkeye, a black Labrador retriever. With a heavy sigh Hawkeye lay down in front Tumilson’s flag-draped casket. There, the loyal dog stayed for the entire service. Was he grieving? No doubt he was feeling depressed, sad, and lonely, but also he might well have been waiting, hoping, that his master would return. Perhaps he might get out of the coffin and return to a life with the now lonely dog. This might well be the motivation behind the dogs who have waited for many years at the graves or other familiar sites associated with lost loved ones. Yes there is sorrow, but perhaps something more positive than grief. Becaise dogs do not have a the knowledge that death is forever, at least there is the option to hope – a hope that their loved one might come back again. Dogs, in their ignorance of the true meaning of death, when driven by their unhappiness and motivated by their hope, may sometimes engage in desperate or irrational acts to deal with their sorrow because of separation separation from someone dear to them. Consider the case of Mickey and Percy. As in the case of Dancer and Odin we are again dealing with a dog who has lost a housemate and a friend. Mickey was a Labrador Retriever owned by William Harrison and Percy was a Chihuahua that was given to Harrison’s daughter, Christine, when Mickey was already a young adult. Despite their size and age differences, the two dogs were good friends and playmates until one evening in 1983 when Percy ran out into the street and was hit by a car. While Christine stood by, weeping, her father placed the dead dog in a crumpled sack and buried him in a shallow grave in the garden. The depression that fell on the family seemed to affect, not only the humans, but also Mickey, who sat despondently staring at the grave while everyone else went to bed. A couple of hours later William was awakened by frantic whining and scuffling outside the house. When he investigated the noise, he saw to his horror that the sack in which he had buried Percy was now laying empty beside the opened grave. Next to it, he saw Mickey, who was in a state of great agitation, standing over Percy’s body, frantically licking his friend’s face, nuzzling and poking at the limp form in what looked like a canine attempt to give the dead dog artificial respiration. Tears filled the man’s eyes as he watched this futile expression of hope and love. He sadly walked over to move Mickey away when he saw what looked like a spasm or twitch. Then, Percy weakly lifted his head and whimpered. It would be nice to believe that it was some deep sense in Mickey that had recognized there was a faint spark of life in the little dog, however it is more likely that it was his lack of understanding of death that was behind his actions. Rather than being swamped by grief over the permanence of dying, Mickey was left with nothing but hope for the return of his well-loved little housemate. Hope seems to have motivated him to make one last try to save his tiny friend — and this time it worked! Henry Fersko-Weiss working as an end-of-life doula for Gloria Luers, 92, of Cliffside Park. Fersko-Weiss helped start a doula program at The Valley Hospital and is beginning another at Holy Name Medical Center. At 92 and with cancer spreading through her body, Gloria Luers knew she didn’t have much time. She began contemplating her final days, saying she wanted to be surrounded by family and to listen to stories and her favorite music. But in those last days, she would also have strangers join the round-the-clock vigil at her bedside, people she had never met but who would nevertheless walk into her room knowing that she liked Italian tenors and the lumbering sounds of her great-grandchildren at play. Robert Gutenstein of Ridgewood in his bedroom, which he shared with his wife, Ellen, who died nearly a year ago after battling cancer. These strangers, all volunteers, would be there to comfort and console Luers and her family as death neared, making sure her final wishes would be followed and that her dying days paid homage to her living ones. While hospice workers would manage her physical pain and guide her care, the volunteers, known as end-of-life doulas, would be there so family members could sleep and take a break, supporting everyone through what would be a long, exhausting experience. Their mission would be to help Gloria Luers and her family remain focused on her life instead of her illness and, in the process, gain some peace. When the family decided to accept the offer by the hospice program to provide the doulas, her daughter, Denise Rich, said she was comforted to know that she wouldn’t be alone if her mother’s death came at a time when her husband was away at work and other family members couldn’t get there quickly enough. The word “doula,” evolved from its ancient Greek meaning of “woman who serves,” has most often been used to refer to someone who coaches a mother-to-be through childbirth, providing emotional support through what can be a scary experience. Henry Fersko-Weiss, a longtime social worker, said it’s a concept that can be applied at the end of life. Five years ago, he helped start an end-of-life doula program, a free service, at the hospice run by The Valley Hospital in Ridgewood, where the doulas are trained to recognize the signs of approaching death and schooled in easing the stress of a dying person and their families. He is now launching a second program, this one based at Holy Name Medical Center in Teaneck. Paid hospice staff supervise the two programs, but volunteers provide all the bedside support. Fersko-Weiss, who also founded the International End of Life Doula Association, said he hopes doulas will one day become part of the standard of care at hospices, assisted-living residences and nursing homes around the world. “We help people be born into the world, why wouldn’t we also want to help as they transition out of this world?” said Janie Rakow of Wyckoff, a doula with Valley. Rakow and other doulas were there in the final days of Ellen Gutenstein’s life last April. Her husband and daughter often look back on what it meant for them to have seven strangers come in to help when she began to drift away. By then, the 77-year-old Gutenstein’s physical world had shrunk to the bedroom she and her husband had shared for decades in their Ridgewood home, her hospital bed wedged next to the couple’s wood-framed, king-size bed. The room was crowded with medical equipment, and the tops of dressers and bureaus were filled with medicine bottles and the other detritus of terminal illness. But it was brightened by pictures of the grandkids and beloved collectibles. As much as possible, for as long as possible, members of Gutenstein’s family wanted her to remain a part of their lives. But even with her husband sleeping in the bed next to hers, her daughter staying over most nights, and her two sons and grandchildren making regular trips in from out of town, it was hard for one of them to be awake and at her bedside every minute of her last days. In the blur of that emotional time, Robert Gutenstein has forgotten the names of the doulas who spent three or fours hours each keeping watch while sitting in the chair next to his wife’s bed, including the one who was there at the end. But the family hasn’t forgotten the works they performed. There was the one who lifted their spirits with her beautiful singing voice. There were the others who read aloud to Ellen from the “legacy book” the doulas had encouraged the family to assemble, an album of photos from vacations and major life events as well as letters and written reflections from her children, grandkids and friends. Kristen Tsarnas, a volunteer doula, said death is a subject in which society has not advanced for the better. In the frontier days, when hospitals were few and far between, a family brought a loved one home to die and the community came to bear witness to the leave-taking. “This kind of tending to someone at the end of life is really an old thing that kind of disappeared from our modern society,” said Tsarnas, who lives in Allendale. In describing her role as a doula, she often uses the word “witness.” “It’s sort of a way for the family to feel the significance of the moment — that this is an important enough event that some stranger came to my house to be there for the end of my mother’s life,” she said. Her view is shaped by the sudden death of her stepfather when she was 18. He was hospitalized, but not expected to die. So she didn’t return home from college and her mother didn’t stay the night at the hospital. More than two decades later, both are burdened by his being alone when he died. 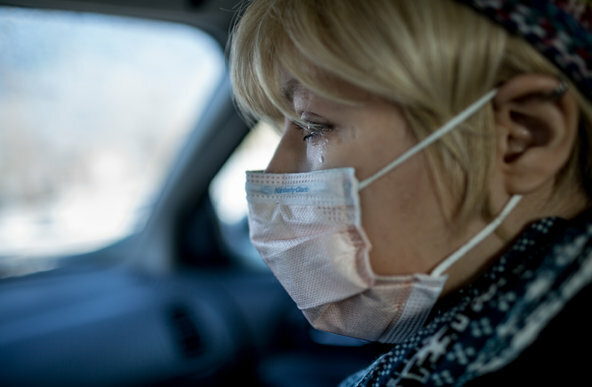 “No one should be alone in a hospital in a cold room when they die,” Tsarnas said. Hospice programs provide dying patients and their families with a host of services — nurses, social workers, grief counselors, medicine and medical equipment — intended to ease pain and suffering. But hospices can’t offer round-the-clock staff and while their social workers and grief counselors attempt to prepare families for the final days, he said, many still find themselves overwhelmed by the changes that can unfold quickly at the end of life. The doulas are trained in calming and soothing techniques, such as meditation, aromatherapy and therapeutic touch. Most don’t come from medical or counseling backgrounds, and they are not expected to take on the direct caregiving tasks that hospice staff and home aides perform. Their job descriptions are more amorphous — some see it as akin to social work, nursing or ministering. Others say the mission is simply to be present and ready to serve. “A lot of our doulas are very spiritual, holistic kind of people who just have a calling to do this,” said Bonnie Schneider, who manages Valley’s doula service, which is offered as a no-cost service to patients in the hospice program. At a recent training session for the 19 volunteers learning to be doulas for the Holy Name program, Fersko-Weiss stressed the importance of a lead doula paying early visits to a dying person to help create a “vigil plan” that spells out what that individual wants — candles burning, their hands held, poems read and the like. Such plans are shared with all doulas assigned to the case. The doulas need to be sensitive, Fersko-Weiss told the trainees, to the fact some families may have conflicts still playing out, so they should try to encourage family members to express their feelings of loss and to both seek and offer forgiveness. Since Valley began its program in the fall of 2009, the doulas have participated in more than four dozen vigils, many in private homes, but some in nursing homes or in-patient hospice centers. The typical vigil lasts 24 to 48 hours, Schneider said, and the longest went eight days. Valley’s 40 doulas have worked with many other terminally ill patients and families, helping them to think about how they want the final days to play out. The doulas are called in at the onset of what’s called the active dying stage, when they exhibit symptoms such as slowed breathing, a drop in blood pressure and a third day of refusing to eat. For Bob Eid, a doula from Mahwah, being at a death is a profoundly moving experience. Before Coleen Shea made it her official calling to sit with the dying, family circumstances put her at the bedsides of three of her own. The first was six years ago, when her 92-year-old grandmother died and the scene at the bedside was like something out of a Hallmark special, children and grandchildren lined up three deep around her bed. Shea also spent time with two uncles in their final days. Those deaths were less peaceful, but no less moving. She recalls when one uncle suffered a painful seizure a few days before his death. She comforted him by telling him that he had fought bravely and that it was all right to let go. “I sort of felt like I had made a difference,” she said. The Glen Rock mother of two compares her doula position to that of a nurse who must move from room to room, tending to different tasks and needs in each. She doesn’t expect a family to get to know her. Instead when she walks into a new home, she scans her surroundings for the things that most need doing — someone in need of a break or a comforting word, or a patient with arthritic hands who might enjoy a massage. Rakow, who volunteers for both the doula and hospice programs at Valley, said she is routinely asked whether being present at so many deaths makes her sad. Nearly a year after his wife’s death, Robert Gutenstein still regularly pages through her legacy book. The last picture, taken just a few days before her death, is of Ellen celebrating Easter dinner with her family and friends. Silvershein was headed to bed a little after 11:40 on Friday, April 25, when she stopped into her parents’ room to say good night. She and the doula noticed a change in her mother’s breathing pattern and woke her father, who had been asleep for a few hours in the bed next to his wife’s. Rakow, who had served as the lead doula on Ellen’s case, arrived at the home with bagels for breakfast the next morning. Several doulas attended the funeral. A month later, Rakow and Silvershein together talked about the shared experience. Silvershein credits the doulas with helping her find her way in those emotional days. Because a person’s hearing can be the last sense to go, the doulas encouraged her to keep reassuring her mother, even after she drifted out of consciousness. Her memory still firm and clear, she regaled him with anecdotes from a girlhood living without a mother, her husband’s war years and the years she spent tending to children and grandchildren. “I am good at telling stories, and I have some good ones to tell,” Luers said. Fersko-Weiss pledged to write them down and help her family assemble a legacy book for her loved ones. Luers began to decline a week ago, no longer able to speak and unable to get out of bed, and was moved to the Villa Marie Claire hospice in Saddle River. Her daughter stayed over most nights and her son and grandchildren visited often. On Wednesday, five doulas began taking shifts, playing songs sung in Italian by Andrea Bocelli and sitting with family members as they shared stories and talked about the Fort Lee home where Luers raised her family. “It was a lot of reminiscing and talking about the things that stood out about her in life,” Fersko-Weiss said. About 9 a.m. Friday, as Gloria’s breathing became shallow, Fersko-Weiss woke her daughter, who was sleeping in another room after being up much of the night with her mother. Gloria Luers died about 15 minutes later, with both of her children, a grandson and Fersko-Weiss — not a stranger anymore — at her bedside. SEATTLE — Turning a death bed into a garden bed is the idea behind the Urban Death Project, a non-profit group looking to provide a human composting facility. The facility would be a repository intended for city dwellers to turn their departed into compost suitable for use in a garden or orchard. “I love the idea of growing a tree out of someone I love that I’ve lost,” said Urban Death Project founder Katrina Spade. She came up with the concept in 2011 and was awarded a $80,000 grant in 2014 from Echoing Green, a New York based environmentally conscience philanthropy. “Cemeteries don’t hold any meaning anymore,” said Spade. She see the tons of metal, wood and cement that are buried each year — as well as the hundreds of gallons of embalming fluid — as wasteful and unnecessary. She doesn’t oppose an person’s right to choose a traditional burial, but she wants to provide a more environmentally friendly option. “As long as it’s a safe and sanitary and effective way of bringing a body into another state, I think there should be many options,” said Spade. She’s proposing to build a three story building where family and friends would bring in their deceased loved ones wearing only a biodegradable shroud. She says with proper care, it takes about six weeks for a body to full decompose, bones and all, into a course granular soil. Spade knows her project faces many legal and zoning hurdles. Washington’s current state law requires the bodies of humans to be buried, cremated or donated to science. If bodies are transferred out of state, then the laws of the next state go into effect. Many states are legalizing water cremations, a process known as alkaline hydrolysis. Spade thinks it’s time to flesh out new forms of burial, especially since many urban centers no longer allow new cemeteries to be built.